The 2014 winners of the National Dairy Council Kerrygold Milk Quality award was the Dwan family in Thurles, Tipperary. The farms’ average annual SCC dropped dramatically in 2011 – the same year the Dwans started milk recording. This was the start of new practices and routines on the farm which, they say, contributed to excellent milk quality. 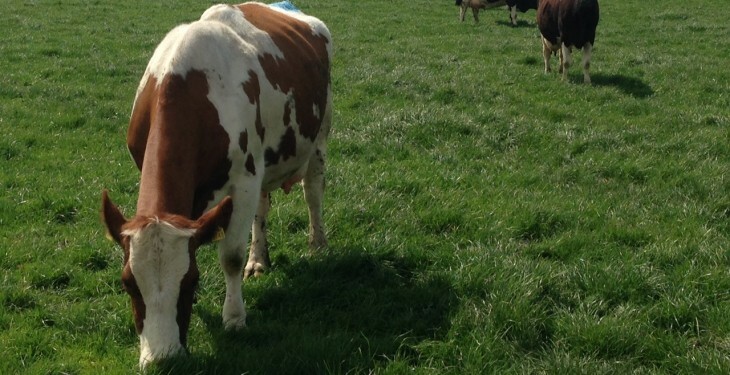 A number of high SCC cows were identified and culled from the herd. The Dwans also began pre-dipping that year to prevent mastitis spread through the herd. Thomas Dwan considers a cow with SCC reading of over 200,000 as a problem cow. Distribution of cows into chronic, cleared, recent and uninfected categories from milk recording reports (Source: Milk Recording Report, September 2014). All cows milked twice a day for four days with reduced feed. All cows milked once a day for three days, again with reduced feed. After last AM milking, cows are dried off (16 cows at a time). Cows’ teats are wiped with methylated spirits before infusion of a long-acting dry cow tube. Teat sealers are then inserted. Teats are dipped before cows are let out. Cubicle beds limed once a day during housing. Cubicle beds are scraped off twice a day. Cubicle beds limed twice a day. Cubicle beds scraped off twice a day. Teats pre-sprayed before clusters are put on. Teats stri pped and pre-spray removed before clusters are put on. Clinical cases are milked last and tubed until clear. 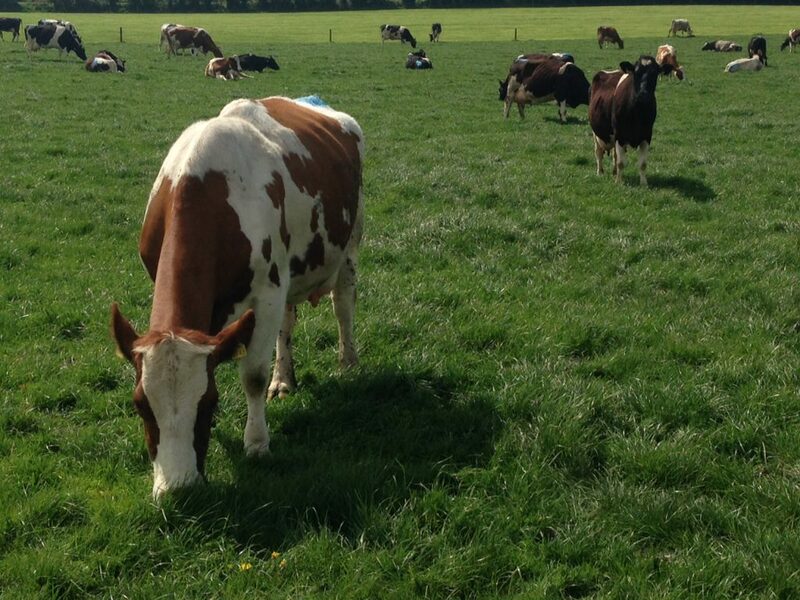 In 2014, the herd experienced eight clinical cases of mastitis. In 2015, the herd has had six clinical cases to date. er milking these cows with peracetic acid to prevent mastitis spread. Outside of the clusters washed with running water and cups put on. and the water run to waste. The plant is further rinsed with 1.0 gallons (4.5L) of water a second time. The filter sock is removed at this stage and it is changed every day. in contact with the machine overnight. The ‘wash’ is rinsed out of the plant before morning milking. A descaler is used once a week. Liners are changed twice a year. Machine serviced once a year and also checked for stray voltage. The herd of black and white cows on the Dwan farm come from the more traditional British Friesian type with some Montbeliarde back breeding. 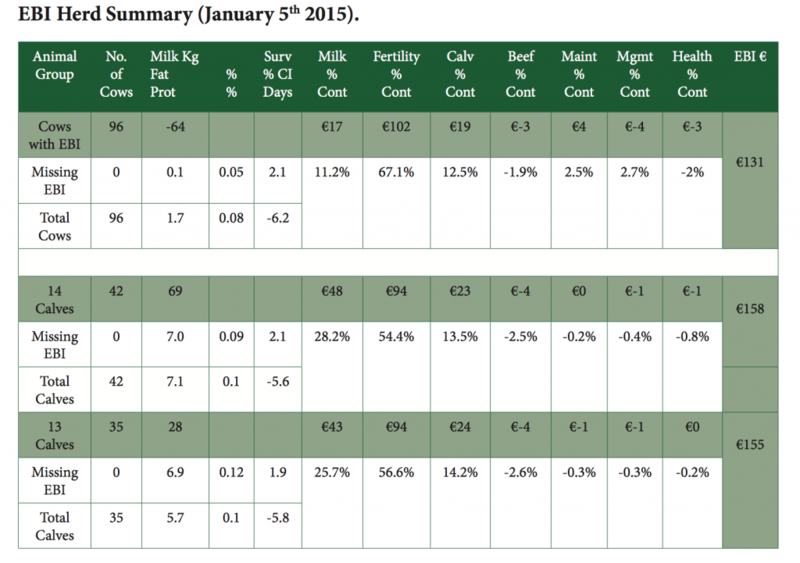 In more recent years, higher EBI Friesien and Holstein AI sires have been used. 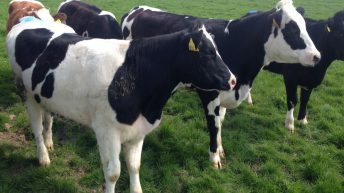 The heifers introduced to the herd this year (13 Calves in EBI Herd Summary) have similar genetic merit for fertility but higher milk production potential. See the herd of cows in the video. In 2014, the Dwans produced 546,545L of milk (480,545L sold) with the remainder fed to the calves. With fat and protein content of 4.05% and 3.56% respectively this equated to 416kg of milk solids produced (366kg sold) per cow. 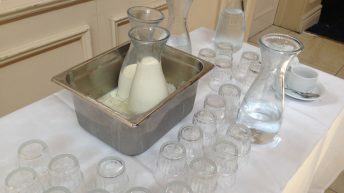 spent in milk in 2014 and the volume of milk produced as a result. Cows are batch fed in the parlour with an average of 480kg concentrate fed per cow. Calving started on January 27, 2014 and median calving date was 15 days later on February 11. Some 92% and 97% of cows were submitted in three and six weeks respectively.